Don’t let the size of those boxes under the Christmas tree fool you. Good things sometimes come in little packages, and here’s a video from the University of Michigan to prove it. 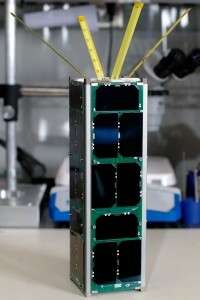 Tabletop space weather satellite before its launch. U of M students designed and built a satellite called RAX, or Radio Aurora Explorer, to fit into the standardized 10 cm x 10 cm x 10 cm frames of the CubeSat initiative, which puts low-cost instruments into orbit. Funded by NSF, RAX is a joint venture between the university and SRI International. Basically the idea is to study plasma instabilities in the ionosphere. These clouds of magnetic disturbance can disrupt communications between Earth and spacecraft. RAX receives and processes signals from incoherent radar based in Alaska that are scattered by these plasma clouds. This makes RAX the NSF’s first space weather satellite. Launched one month ago today, the mission has already dealt with low-power problems with the batteries, but has also proved successful in receiving signals from the radar in Alaska. You can keep track of RAX on the mission blog, and hear Hasan Bahcivan of SRI present the latest on the mission at the AMS Annual Meeting in Seattle (Tuesday 25 January, 4:45 pm, 4C-3). Also, Richard Behnke of NSF will discuss cubesat and other aspects of the NSF space weather plans (Monday 24 January, 11:45 am, 4C-3).